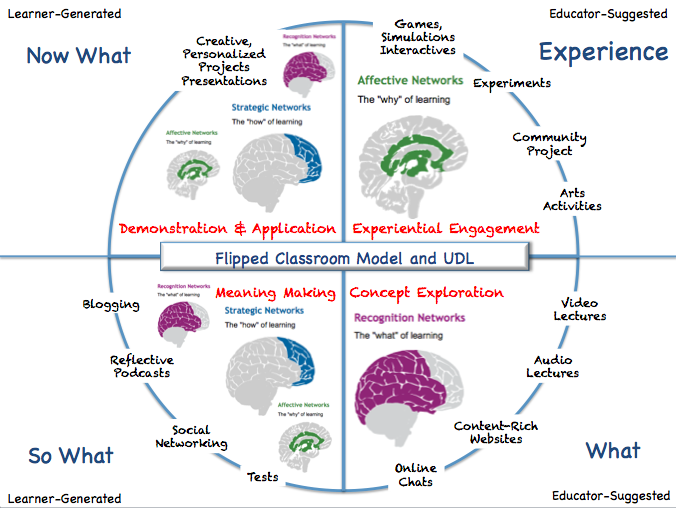 In response to all of the attention given to the flipped classroom, I proposed The Flipped Classroom: The Full Picture and The Flipped Classroom: The Full Picture for Higher Education in which the viewing of videos (often discussed on the primary focus of the flipped classroom) becomes a part of a larger cycle of learning based on an experiential cycle of learning. 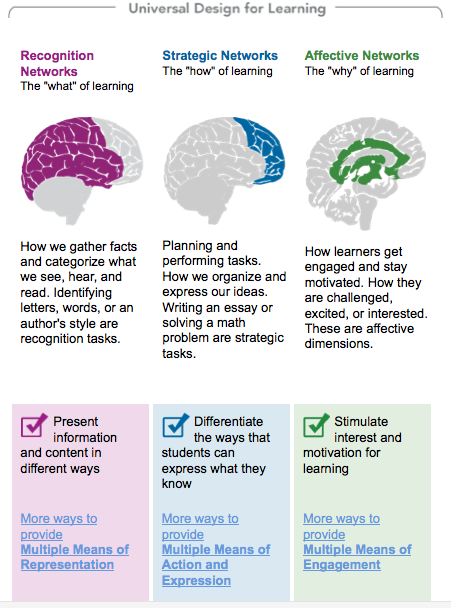 Universal Design for Learning has also been in the news lately as a new report Universal Design for Learning (UDL): Initiatives on the Move was released by the National Center on UDL, May, 2012. This post describes the principles of Universal Design for Learning and how they naturally occur when a full cycle of learning, including ideas related to the flipped classroom, are used within the instructional process. reported a high degree of familiarity with the UDL principles. All state leaders reported having good, very good, or excellent familiarity with the UDL principles, while more than half of the local leaders reported being extremely or moderately familiar with the UDL principles. linked UDL with other education initiatives that embrace universal approaches occurring in general education environments, e.g. response to intervention (RTI), positive behavioral interventions and supports (PBIS), and differentiated instruction. 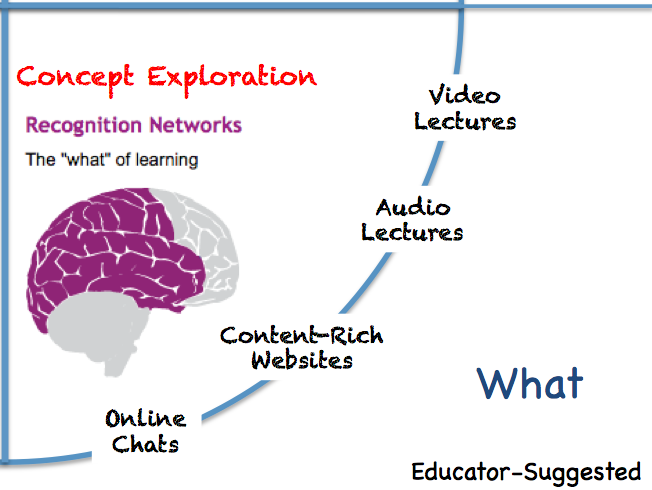 perceived a connection between technology and UDL. strong connection between UDL and standards-based education initiatives, e.g. the Common Core State Standards and statewide assessments. UDL was addressed as part of their state technology plans or in the context of 21st century learning. critical to UDL advocacy:two factors are critical to UDL advocacy: (1) state leadership need to embrace UDL and (2) UDL must be understood as a general education initiative that moves beyond special education. As I stated in my introduction, I proposed an experiential flipped classroom learning model in response to all of the attention being given to the flipped classroom. I think it is a great opportunity to change the predominant didactic model of education that is especially prevalent in upper elementary through graduate school education.This model has experiential learning at the core of the learning process with the content videos supporting the learning rather than being the core or primary instructional piece. UDL is a strategy, a process that provides opportunities for all students, not just those with special needs (but I believe all learners have special needs), to be successful learners. 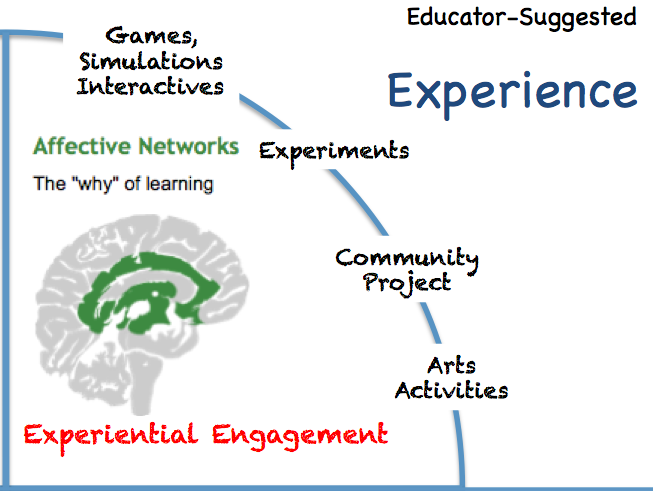 This is the same goal for the flipped classroom model designed as an experiential learning cycle. What follows is how an experiential flipped classroom learning model, that includes elements of the flipped classroom, fits the principles of UDL. Explanations are provided about how the principles of UDL are naturally and seamlessly addressed in this model. The primary UDL principle addressed during this phase is Provide Multiple Means for Engagement. The goal of this phase, in line with the tenets of experiential learning, is to hook or motivate the student by engaging him or her on a personal level. The primary UDL principle addressed in this phase is Provide Multiple Means of Representation. This is the phase where videos, as proposed by the flipped classroom, are utilized to assist students in learning the theoretical concepts related to the content being covered. As previously noted, though, the videos are used to support, introduce, and reinforce the theoretical content as opposed as being at its core. Videos should not be the only source of concept formation. 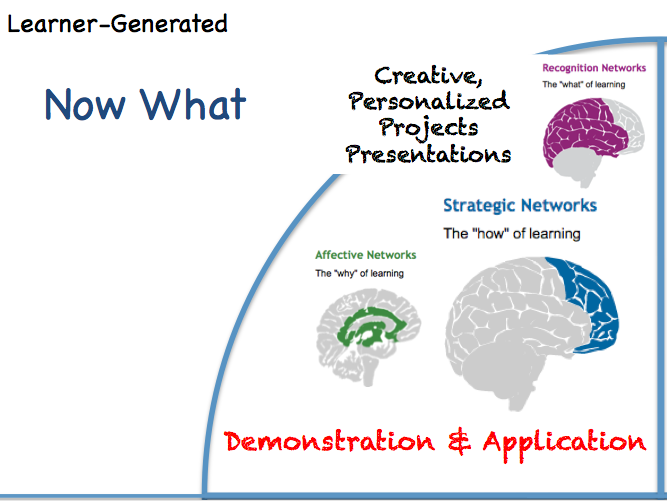 To support learning, a multimedia learning environment needs to provide multiple, flexible methods of presentation. Ways of addressing this principle include presenting material in a variety of formats (http://www.cited.org/index.aspx?page_id=147). Interactive websites and ebooks, simulations, and content-rich websites can also service this purpose. The learner should be offered a menu of resources to study and learn about the topic. Provide visual diagrams, charts, notations of music or sound to support auditory content and information. The primary UDL principle addressed during this phase is Provide Multiple Means of Action and Expression. Learners, during this phase, construct their own meanings and understanding of the experiences, content, and topics covered in the previous phases. They do so via blogs, vodcasts, podcasts, Voicethread, Edmodo, wikis, and other web 2.0 tools that allows for personal reflection and expression. A digital environment supports student learning when it provides multiple, flexible methods for student action, expression, and apprenticeship (http://www.cited.org/index.aspx?page_id=147). As with content presentation, several options should be offered to the students. The Multiple Means of Representation are also reinforced during the meaning making phase as learners are asked to . . . The Multiple Means of Representation are also reinforced during this demonstration and application phase as learners . . .
Jackie, this is tremendous work! I haven’t been able to read every word or follow all your links yet, but it is impressive! I’d love to have a long talk with you about the whole concept. Maybe we can carve out a few minutes at ISTE? yeah right LOL! Thanks, and of course, we can hang out a bit at ISTE! I look forward to it! One of the issues for UDL has been that of time to provide individualization required to meet specific needs of all students. I see how the Flipped Classroom can free up a teacher’s time do this. One component of UDL that I don’t see mentioned here, but I think is important, is to ensure that all needs are considered by conducting or, at least referencing, the student profile before each unit. That way, nothing is assumed and any accommodation overlooked can be identified during the planning of the unit. 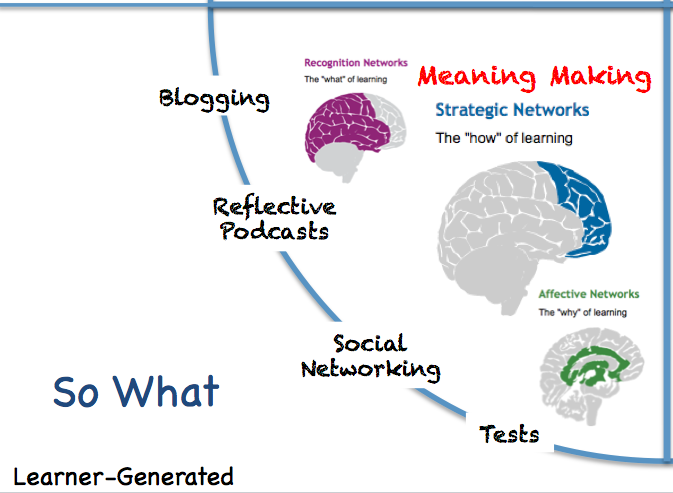 Is your learning model directly based off of Dr. Bernice McCarthy’s Learning Cycle (4Mat)? I like how you have married the two models together, but think you should give credit where credit it due. . . It is actually in line with Kolb’s work when I mention in earlier post mentioned in the beginning of this post. Awesome! Do you mind if I share your work during a session on helping special education students using technology? Of course you can share – all my work is creative commons – share with providing me attribution.